While I am not not a fan for Trump; his pick for Secretary of Defense is certainly a step in the right direction to win me over. General James Mattis is a true leader I've admired for a long time. He is a Marine's Marine. No nonsense, tell it like it is kind of guy who has integrity along with intensity. A strong proven leader who truly cares about our troops is exactly what we should be looking for in a Secretary of Defense. It strikes me funny how some of my liberal friends are already up in arms over Trump's nomination pick for Secretary of Defense. One was ranting that the Department of Defense should be ran by a life long civilian, so there is no conflict of interest or "personal bias based on career background" as one friend put it. The same friend, who by the way, was up in arms over Trump's pick of Betsy DeVos for Secretary of Education for NOT having a stronger background with the public school system. Some who are up in arms over General Mattis do have one valid point. There is a requirement that a Secretary of Defense must be retired from the military for at least seven years and General Mattis has not been retired from the Marine Corps that long yet. But that can be overcame. That condition was waived for General Marshall in 1950 to be our nations 3rd Secretary of Defense. 1) General Marshall was one of our nations five start generals during World War II. That rank was created due to the size our Army and Navy grew to for the war effort. That rank was going to be given the name Marshall, but General George Marshall raised a fuss about being call Marshall Marshall, So the legend goes anyway. 2) One of the early stages of our path down the horrible road of political correctness is after Word War II when the War Department was reorganized into the Defense Department. Like with Marshall, I think it will be safe to say Mattis will be approved by Senate to become our next Secretary of Defense. The man is a great fit for the position. 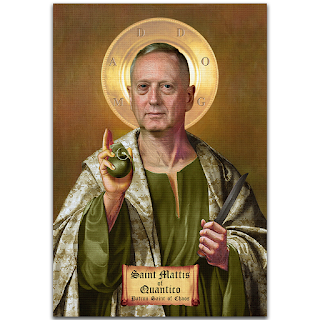 Secretary of Defense Mattis has a nice ring to it.